Ahoy there! We have moored our boat bang in the centre of John Soane’s wonderful Stock Office at the Bank of England museum, and we welcome you aboard! Why have we done this? Well, it’s not a real boat, but a dramatic piece of staging to help communicate the role and purpose of the Bank of England following the institution’s reorganisation last year. This was a very exciting and challenging project which together with other refurbishments around he Museum, involved project managing lots of elements and people. The Bank had commissioned an animated film, “Keeping on an even keel”, with a strong nautical theme (a kind of financial Captain pugwash - without the piracy). They had also produced literature explaining the Bank’s core purposes - maintaining a stable financial system and keeping inflation on target - and an app to help build awareness of banknote security and detect forgeries. Our brief was to introduce these themes and to give visitors an easily digestible overview and direct them to other resources. We wanted to streamline the display area and create a strong, themed centrepiece to an already impressive space. Our initial plans for the boat concept received a very positive response. Next we brought in Russell Stewart of Cubit 3D to work up the design into a three dimensional structure. The structure was to have no fixings which impacted on the fabric of the building, and power supply and security had to conform to the Bank’s guidelines. It also, of course, had to accomodate the graphics and interactives which formed the display’s content. In addition we needed to incorporate Clay interactive’s to design and build the staging for their inflation interactive game. Cubit 3D’s design solution was based on traditional boat building techniques with a free standing interlocking rib structure cnc cut from birch plywood. Using only 2d cut shapes the structure and graphics succeeding in mimicking the multiple 3d curves in a boat’s structure. The piece was beautifully realised and installed by B Scenic, who fabricated and test built in their Edinburgh workshop and delivered "flat packed" to the Bank for completion. The Display was carefully managed and completed on time (and on budget) ready for launch by the Governor at an event on 1 April. 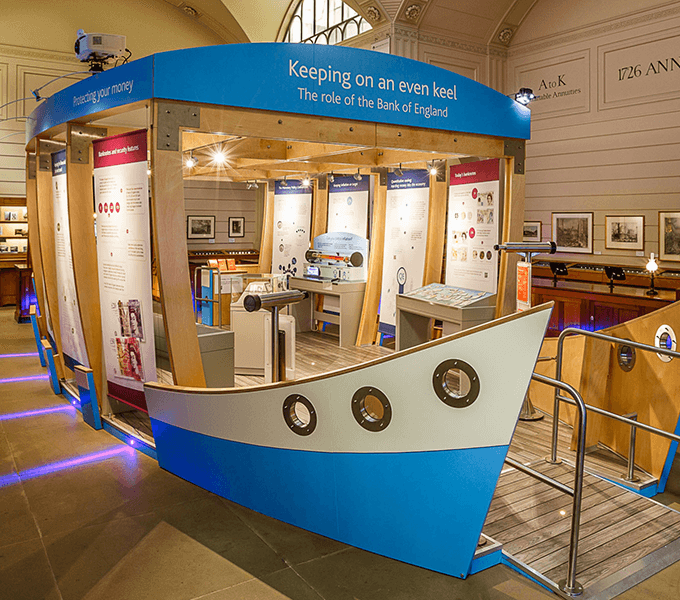 We refurbished and incorporated interactive desks from previous displays: Banknote jigsaws, Safecracker game, balance interactive and new telescope interactives (made by Science Projects). Staging for two installations of Clay’s Inflation game and housing for their Timeline interactive projector. In addition to the graphics on the boat we also designed and installed banners, wayfinding graphics and other panels throughout the museum. We also designed and installed a temporary exhibition ’Curiosities from the vault’, featuring unusual ad unexpected objects from the Bank’s collection. ready for the April re-opening. The boat is expected to remain on display for at least five years, and has been designed to make changing and updating graphics easy. 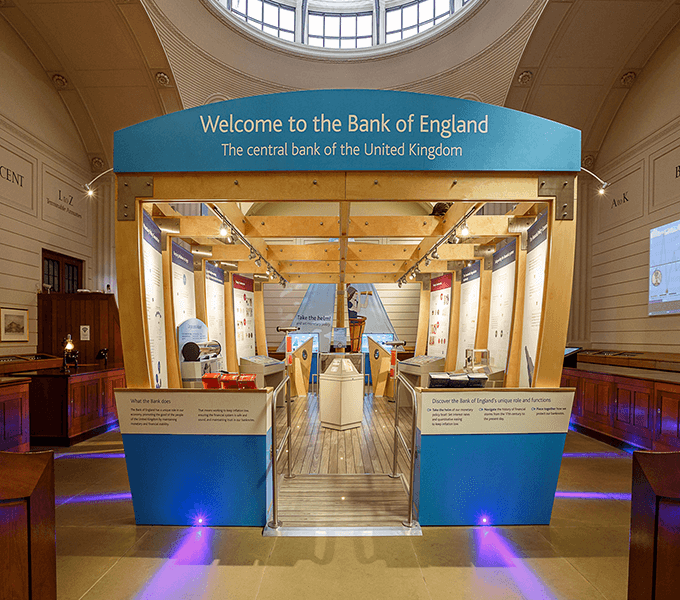 Several of our exhibition and display projects are featured in this virtual tour of The Bank of England Museum.